Twenty-five thousand years ago the spike was the Garden of Eden. Today it is modern society. The beginning of each new evolutionary cycle brings an era of great change, human innovation, and accompanying destruction of old ways. As the Earth enters its next 25,000 year precession, our solar system will pass through the galactic plane of the Milky Way galaxy. When this happens, a gravitational wave — which exists as a flat plane along the equator of the galaxy — will pulse across any passing solar system, including Earth and its Sun. Now I’m not generally alarmist, but from what I’ve been reading lately — there are three main historical predictions that make me stop to wonder if the end is, in fact, coming nearer this year. Over 5000 years ago the ancient Mayans created a “long count” calendar, carved on stone, which according to calculations ends on December 21, 2012 and marks the end of an era. He mentions — “The Great Star will blaze for Seven days,” meaning the comet will be very near the earth for seven days and nights. It is not clear whether this comet will strike the earth or will pass very close to our planet, causing massive earthquakes and other cataclysmic occurrences. But all interpreters of his quatrains are united on the opinion that it will be a comet which will come somewhere in December 2012. What Did The Maya Really Say About 2012? 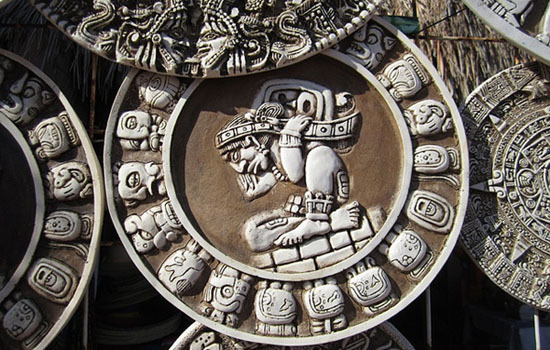 A great article on the meaning of the Maya Calendar by Norbert, a 21st century cultural explorer. End of the World Art Show. Opening at the cre8ery in Winnipeg, on December 21, 2012 — the date the Mayan ‘long count’ calendar ends. Featuring new work by Michael Luczak, Shawn Berard, and Val Huffman, with visual commentary on the new earth cycle to follow, with an interesting blend of darkness, humor, and hope.